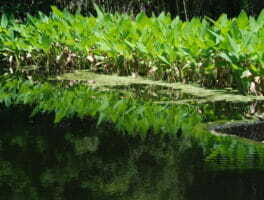 Moccasin Lake Nature Park preserves a lush patch of native forest and a stream for the public to enjoy. Centered on a popular nature center which cares for rehabilitated raptors, it’s an ideal place to take the kids for a gentle nature adventure. Moccasin Lake may not be the most tempting name for a beauty spot in an urban area, but rest assured that this nature center provides you and the kids a great getaway if you live in the Clearwater / Tampa area.